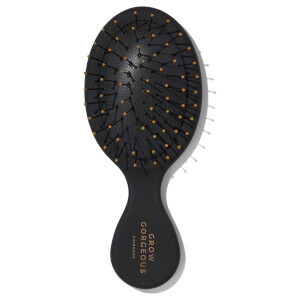 Transform your tresses with the Grow Gorgeous Hair Retreat R&R Routine. The trio of haircare products utilises an ultra-nourishing blend of actives, extracts and vitamins to restore strength and vitality to locks, creating soft, healthy and shining hair from root to tip. Includes a branded hairbrush. Rejuvenate damaged hair with a lightweight, non-foaming formula that effectively cleanses and fortifies dry, weak strands from root to tip. Infused with a cocktail of beneficial ingredients, including Amino Acids, Sea Satin™ and Bamboo Extract, the purifying shampoo refreshes and hydrates hair, whilst promoting strong, resilient tresses that feel healthy. Vitamins B and E are combined with Cupuassu Butter to nourish and protect hair that has been damaged by bleaching and excessive heat styling. Breakage-prone locks are regenerated with restored vitality. Revive damaged locks with an intensive fortifying treatment that restores, protects and strengthens stressed hair damaged by bleaching and excessive heat styling. The reparative formula combines the benefits of ultra-moisturising Murumuru and Cupuassu Butters, Sea Satin™ and silica-rich Bamboo Extract with Vitamin B, E, and Keratrix™ (a restorative natural active that works to improve elasticity in weakened tresses). Expect intensely nourished and conditioned strands with resilience to breakage and a smooth, hydrated look. Intensely formulated to encourage hair thickness, the concentrated salve leaves hair looking longer, whilst feeling fuller, healthier and thicker. Made with an active complex that combines Acetyl Tetrapeptide-3 and Clover Flower Extract, the serum works to create visible results within four weeks. Infused with Hyaluronic Acid to moisturise your scalp, it also contains a Bio-Active Pea Sprout Complex and a Bio-Active Complex of Chinese Skullcap, Soy Sprout and Wheat Sprout, helping to activate and diligently improve hair density. Sjampo: Fukt håret grundig før du påfører en generøs mengde. Skum og masser fra hodebunn og ut til hårtuppene. Denne sjampoen er sulfatfri (hurra for ditt hår! ), så til forskjell fra tradisjonelle sjampoer skummer ikke denne. 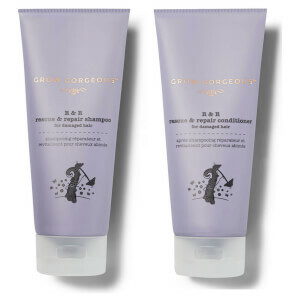 Skyll og følg opp med Grow Gorgeous Rescue & Repair Conditioner for best resultat. Balsam: Etter å ha brukt vår Rescue & Repair Shampoo bør du klemme ut overflødig vann og påføre en generøs mengde Grow Gorgeous Rescue & Repair Conditioner. Fordel godt ut i lengdene og tuppene og la virke i to til tre minutter. Skyll grundig og style håret som normalt. Serum: Påfør 20 dråper på hodebunn og masser godt inn i håndkletørt eller tørt hår. Vi anbefaler at du deler håret i fire seksjoner og påfører fem dråper direkte fra pipetten på hodebunn langs hårlinjen i den første seksjonen, og masserer godt inn i hodebunn. Fordel overflødig produkt ut i lengdene på håret. Gjenta dette på de gjenværende tre seksjonene, så du påfører 20 dråper totalt. Skal ikke skylles ut. Shampoo: Aqua/Water/Eau, Sodium Lauroyl Methyl Isethionate, Cocamidopropyl Betaine, Cocamide MEA, Acrylates Copolymer, Parfum (Fragrance), Sodium Methyl Oleoyl Taurate, Glycerin, Sodium Cocoyl Isethionate, Cetyl Betaine, Phenoxyethanol, Panthenol (Provitamin B5), Silicone Quaternium-18, Salvia Hispanica (Chia) Seed Oil, Trisodium Ethylenediamine Disuccinate, Butylene Glycol, Triethanolamine, Sodium Chloride, Trideceth-6, Hydroxypropyl Guar Hydroxypropyltrimonium Chloride, Mica, Theobroma Grandiflorum (Cupuassu) Seed Butter, Sodium Benzoate, Trideceth-12, Chlorphenesin, Phytantriol, Caprylic/Capric Triglyceride, Sodium PCA, Hydrolyzed Ceratonia Siliqua (Carob) Seed Extract, Sodium Lactate, Pentaerythrityl Tetra-Di-t-Butyl Hydroxyhydrocinnamate, Arginine, Zea Mays (Corn) Starch, Bambusa Vulgaris (Bamboo) Leaf/Stem Extract, Niacinamide (Vitamin B3), Aspartic Acid, Sodium Starch Octenylsuccinate, PCA, Calcium Pantothenate, Maltodextrin, Potassium Sorbate, Sodium Ascorbyl Phosphate, Glycine, Alanine, Beta Vulgaris (Beet) Root Extract, Serine, Citric Acid, Valine, Pyridoxine HCL, Tocopheryl Acetate (Vitamin E), Isoleucine, Proline, Threonine, Sorbic Acid, Histidine, Phenylalanine, Guar Hydroxypropyltrimonium Chloride, Polyquaternium-7, Silica, Helianthus Annuus (Sunflower) Seed Oil, Tocopherol (Vitamin E), Butylphenyl Methylpropional, Limonene, Linalool, CI 77891 (Titanium Dioxide). Conditioner: Aqua/Water/Eau, Cetearyl Alcohol, Parfum (Fragrance), Glycol Distearate, Ethoxydiglycol, Glycerin, Behentrimonium Chloride, Hydroxyethylcellulose, Phenoxyethanol, Panthenol (Provitamin B5), Salvia Hispanica (Chia) Seed Oil, Quaternium-91, Silicone Quaternium-18, Butylene Glycol, Hydrolyzed Ceratonia Siliqua (Carob) Seed Extract, Cetrimonium Methosulfate, Mica, Astrocaryum Murumuru (Murumuru) Seed Butter, Theobroma Grandiflorum (Cupuassu) Seed Butter, Trideceth-6, Zea Mays (Corn) Starch, Chlorphenesin, Phytantriol, Trideceth-12, Caprylic/Capric Triglyceride, Trisodium Ethylenediamine Disuccinate, Sodium PCA, Sodium Lactate, Arginine, Bambusa Vulgaris (Bamboo) Leaf/Stem Extract, Niacinamide (Vitamin B3), Aspartic Acid, Sodium Starch Octenylsuccinate, PCA, Potassium Sorbate, Calcium Pantothenate, Maltodextrin, Sodium Benzoate, Citric Acid, Sodium Ascorbyl Phosphate, Glycine, Alanine, Beta Vulgaris (Beet) Root Extract, Serine, Sodium Hydroxide, Valine, Guar Hydroxypropyltrimonium Chloride, Pyridoxine HCL, Tocopheryl Acetate (Vitamin E), Polyquaternium-7, Isoleucine, Proline, Threonine, Sorbic Acid, Histidine, Phenylalanine, Silica, Helianthus Annuus (Sunflower) Seed Oil, Tocopherol (Vitamin E), Butylphenyl Methylpropional, Limonene, Linalool, CI 77891 (Titanium Dioxide). Serum: Aqua (Water), Pentylene Glycol, Butylene Glycol, Propanediol, Arginine, Lactic Acid, Sodium Hyaluronate, Dextran, Glycine Soja Germ Extract, Triticum Vulgare Germ Extract, Daucus Carota Sativa Extract, Acetyl Tetrapeptide-3, Trifolium Pratense Flower Extract, Gluconolactone, Pisum Sativum Extract, Scutellaria Baicalensis Root Extract, Caramel, Sodium Benzoate, Calcium Gluconate, Phenoxyethanol, Chlorphenesin, PEG-40 Hydrogenated Castor Oil, Parfum (Fragrance), PPG-26-Buteth-26, Alpha-Isomethyl Ionone, Linalool, Limonene¸ Butylphenyl Methylpropional, Hydroxyisohexyl 3-Cyclohexene Carboxaldehyde.